I mentioned on Friday that one of the things I wanted to work on was our lighting. All of the light fixtures in our condo are the same exact flush-mount, single-bulb, basic fixtures you can imagine – in every room. They really don’t put out enough light for any of the spaces, except maybe the entryway, and they are really not attractive. Something’s gotta give. Lighting in general is something that I have thought a lot about since we moved in. From both a visual perspective, as well as a functional one, the lighting around here just isn’t up to par. I have thought about adding sconces flanking the bed, though I’ve recently rearranged the bedroom furniture, so I’m glad I didn’t do that. I have thought about layering in some freestanding pieces (table or floor lamps) but again, with the furniture not settled, it just doesn’t feel right to invest in anything too much right now. So I opted to start in the kitchen. Here is a place where you cook, clean and spend a lot of time. You really do need a lot of lighting here. This is also a space where I sometimes overflow to the kitchen table to do work when I need a change of scenery, or to really spread out materials, drawings, notes, etc., So a single-bulb fixture with a frosted glass shade really just wasn’t cutting it. Since I don’t know how much we are going to really be doing with our place or how long we will be here, I didn’t want to invest to much into something, so I opted for an option from Ikea. I found the Hektar fixture and figured $30 for a three-bulb down light, done. I had never changed a hard-wired light before, but I did my research, studied up and mostly relied on this video for instructions. The instructions that actually came with the fixture were really of no good for actually installing it, but install it I did. So a few things I’m not super in love with, the electric box doesn’t line up perfectly square in the room, which on this fixture in our galley kitchen, I can really see that the whole fixture is angled in the space, secondly, the fixture itself doesn’t fully cover the electrical box, which really just creeps me out. I don’t like the look of the finished result, mostly because I feel like it doesn’t look finished. But I did get the fixture installed, and it does provide substantially more light in the space. Unfortunately it isn’t perfect, but for a fixture that only cost me $30, it will do for now. 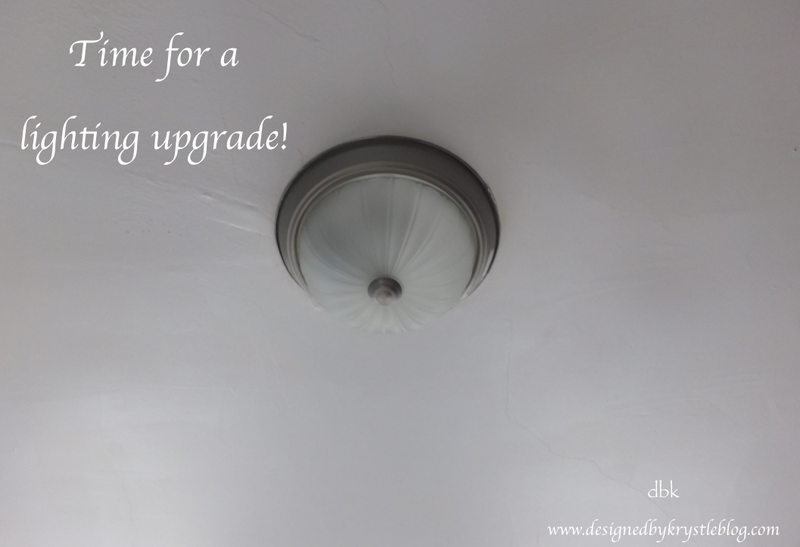 Have you ever changed out any of your fixtures? I’ve also now realized that it is a lot easier than I could’ve imagined! Two big things to remember before attempting a lighting upgrade in your home, if you don’t know what you are doing or don’t feel comfortable handling electricity on your own, do not attempt to do this on your own, call an electrician, or maybe your dad. Either way, reinforcements are a good idea. And most importantly, turn off the electricity to the area where you are working!